How much is Kenny Bartram Worth? Kenny Bartram net worth: Kenny Bartram is an American professional freestyle motocross rider who has a net worth of $3 million. Kenny Bartram was born in Stillwater, Oklahoma. 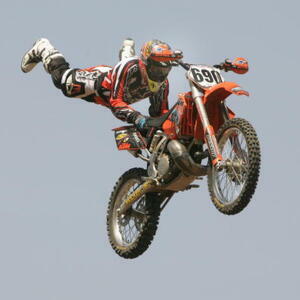 He competed in Oklahoma State Series MX races before starting his career in freestyle motocross. Bartram is the most successful racer in his sport with more than 50 career wins. He has broken more than 20 bones and had seven teeth knocked out. He also also suffered other injuries including a steel plate in his jaw and he damaged a blood vessel in his brain. Kenny Bartram won the 2002 WFA Freestyle in Cleveland, Ohio. He has 10 X Games and Gravity Games medals including four gold, two silver, and four bronze. He signed with KTM in 2009 and has appeared in video games.